As an unrestricted free agent Brad Richardson was still available and so the Coyotes signed him. But, don't they have an overload of centers now? Today, the Arizona Coyotes signed center Brad Richardson to a two-year $2.5 million contract. This is a strange signing. Strange because the Coyotes already have Derek Stepan, Alex Galchenyuk, Marcus Kruger, Dylan Strome, Nick Cousins, and Christian Dvorak playing that position. Sure, Dvorak can play left wing, and Galchenyuk has played that position but has made it known (with GM John Chayka's approval) that his displeasure with his former Montreal Canadiens' team was playing him on the wing. Chayka made it known that they wouldn't have gone after him if they hadn't planned on playing him at center ice. Dvorak can and has played left wing, so perhaps they move him over... oh wait what about Dylan Strome? Where (or should it be if ) will he be playing? We already know that Chayka loves to draft centers. He proved it by drafting Barrett Hayton over a talented scoring winger by the name of Filip Zadina. He took some heat for that and Zadina has already called out Ottawa, and Montreal (he forgot about the Coyotes) stating that he "will fill up their net" when he plays against them. Don't worry Coyotes he will fill up your net too! Now, this writer got to attend the annual Red vs White prospect intrasquad game last Friday night and Hayton is not bad at all. He is a good skater, pursues the puck well and even had a breakaway... but he failed to score. Is he better than Zadina? Debatable. Even if head coach Rick Tocchet plays both Dvorak and Cousins on the wing, with Richardson that makes five centers on the roster. And that doesn't even include Laurent Dauphin who may play in Tucson of the AHL and could make it to the NHL roster during the season. It could even get crowded on the wing. After all, they converted center Clayton Keller from center to the wing, and he led the team in scoring last season. The team added a much-needed scoring winger when they signed Michael Grabner to a three-year $10.05 million contract. Before signing Richardson, Kruger was brought in to center the fourth checking line. He was to be joined by Lawson Crouse who pretty much is replacing Jordan Martinook who was traded to the Carolina Hurricanes in exchange for Kruger. Their right wing was going to be Josh Archibald (right-hand shot). Now, adding Richardson to the mix... who knows? Chayka will certainly have some replacement players in case of injuries. While Richardson is a scrappy player who excels on the penalty kill, his offensive production has taken a hit ever since his severe leg injury two years ago. Last season he managed just three goals, 12 assists in 76 games. Adding Richardson is not a bad choice. He's an excellent face-off player grabbing 52.1% wins in the dotted circle (when he doesn't get kicked out for being too anxious). He also had 72 hits and 52 blocked shots last season. It may become a battle for ice-time, and that just creates more competition to get out on the ice and perform. Not a bad thing, right? With a multitude of centers, perhaps Chayka is thinking of moving Strome. His progress is nothing short of disappointing. He's been up and down from the AHL where he excelled (22-g, 51-a in 50 games) but thus far has only 10 points in 28 NHL games. While it's a tough choice as to whether you stay patient with a player like Strome, or give up and trade him, that is what the team is struggling with at this point of his hockey career. If you put him on the wing, will that inject some scoring results, or just confuse him more? One can only hope that the mistake of then-GM Don Maloney drafting Strome so high at the third overall pick in 2015 when he had Mitch Marner to choose from is not repeated by Chayka's choice of Hayton with the fifth choice. One thing is yet unresolved... who is playing center for this team? Or better yet... who isn't? 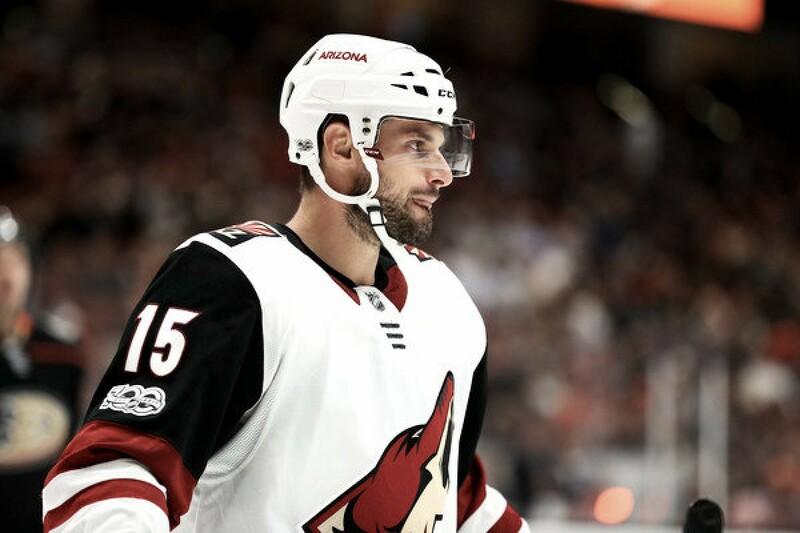 What do you feel was GM John Chayka reason for re-signing Brad Richardson when he already has an abundance of centers on the team? Would you trade Strome? Let us know in the comments section below.